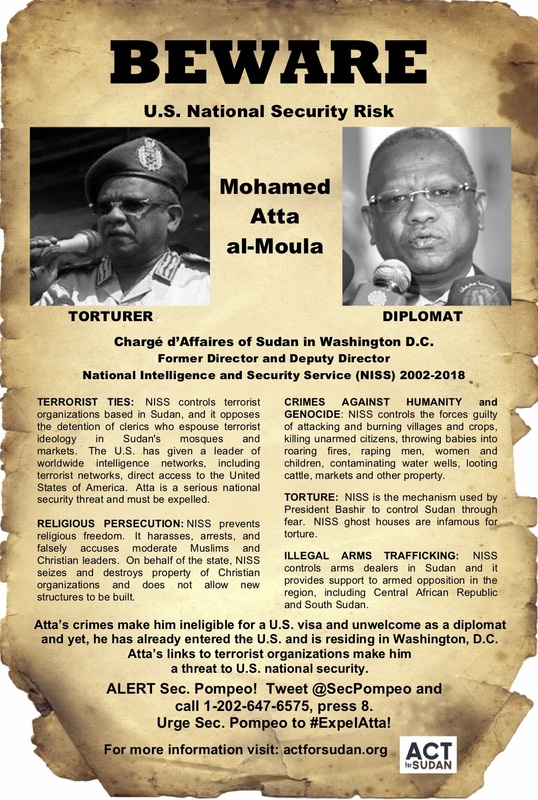 The United States must expel Mohammed Atta, the Chargé d’affaires at the Sudan Embassy in Washington. As the former Director of NISS, he was responsible for organizing and executing serious crimes against the Sudanese people. Atta should be ineligible to be in the U.S., and his connections with terrorist organizations make him a U.S. national security risk. ACTION 3: Print out this flyer and post it at school, work, your local coffee shop, etc. Also, please send a copy to your Members of Congress with a note to pressure the U.S. to expel Atta. If you are in the Washington D.C. area, please contact info@actforsudan.org to be part of a coordinated poster distribution.